This super easy vegan Alfredo sauce with coconut milk is dairy free, oil free, gluten free, nut free, and soy free. In less time than it takes to boil your fettuccine, you can whip up this rich and creamy sauce with just 5 ingredients. 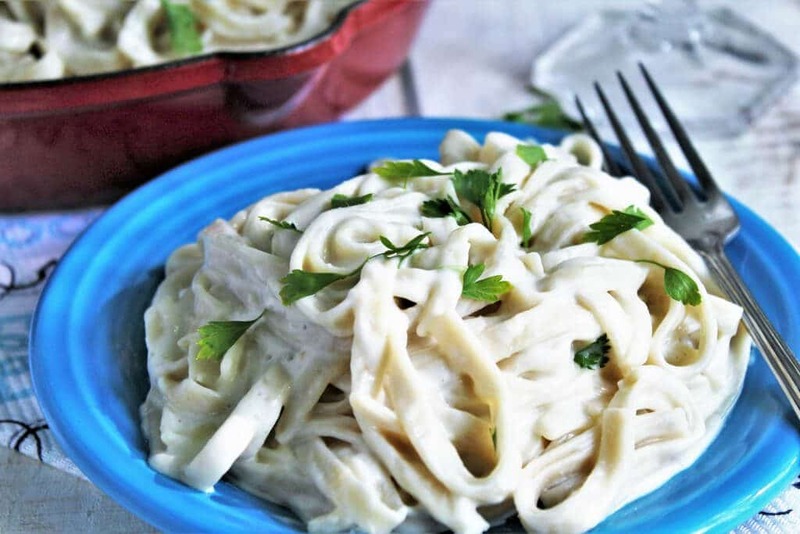 Even though vegan fettuccine Alfredo may seem like a difficult or fancy meal, it’s actually one of the easiest meals that you can make. You can go ahead and put this meal into your busy weeknight dinner rotation! What makes this vegan Alfredo thick and cheesy? The secret to making this sauce the perfect texture is tapioca starch (aka tapioca flour). The tapioca starch thickens the sauce giving it a stretchy cheese texture that stays consistent even after it starts to cool down. *(You can use corn starch, arrowroot, or potato starch instead of the tapioca starch, for a similar effect, but nothing matches the stretchy constancy of the tapioca starch. The other types of starch will also thicken and get gloppy once the sauce cools, whereas the tapioca starch will maintain its constancy even after the dish cools down). I learned the miracles of tapioca starch when perfecting my stretchy vegan grilled cheese recipe. It is the secret ingredient that makes my cheese recipe stretch. How do I make Alfredo sauce with coconut milk? Simply pour a can of full-fat coconut milk into a saucepan and add water, salt, nutritional yeast, garlic, and tapioca starch to the milk and give it all a stir. After all the ingredients are mixed, turn on the heat to medium-low and heat the sauce while stirring frequently until it starts to boil and thicken. Allow it to boil for about 30 seconds and then turn off the heat. Once your pasta is cooked and rinsed, pour the sauce over the pasta and mix well and serve hot. If you like the flavor of smoked Gouda, add 2 tbsp of hickory liquid smoke for a smoked Gouda Alfredo you won’t be able to stop eating! Top with sauteed mushrooms for mushroom Alfredo too! What if I don’t like the flavor of coconut? This Alfredo sauce has a very mild coconut flavor, but if you don’t like coconut, you can easily replace the coconut milk with 1 3/4 cup plain soy milk and 1/4 cup oil. What type of pasta can I use to make gluten-free fettuccine Alfredo? Since we are gluten-free, I make this dish with Tinkyada brand fettuccine noodles. (the noodles pictured) As far as gluten free noodles go, they are surprisingly delicious. However, this sauce tastes great on any shape noodles. Feel free to go ahead and use your favorite pasta. Tip for making perfect gluten free pasta: If you use gluten-free pasta, make sure to boil it in slightly more water than you would boil wheat pasta. Drain it in a colander and rinse well until the water runs clear. Do you want another delicious vegan pasta sauce? Try this vegan vodka sauce! 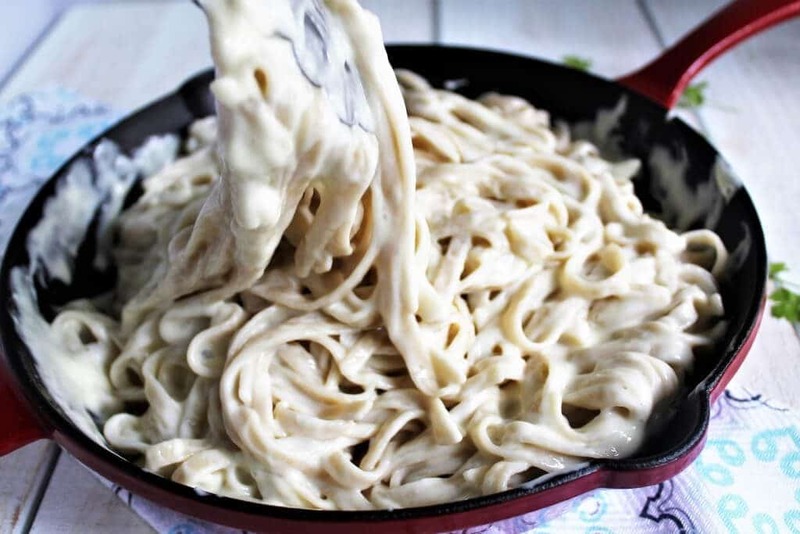 Don’t forget to pin the Alfredo sauce with coconut milk for later! A rich and creamy vegan Alfredo sauce made with coconut milk that is free of gluten, soy, and dairy. Cook pasta of choice according to package directions. While the pasta is cooking, pour a can of full-fat coconut milk into a saucepan and add water, salt, nutritional yeast, garlic, and tapioca starch to the milk and give it all a stir. After the ingredients are mixed, turn on the heat to medium-low and heat the sauce while stirring frequently until it starts to boil and thicken. 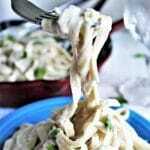 Once pasta has been cooked, drained and rinsed, pour the Alfredo sauce over it and mix well and serve hot. Use full-fat coconut milk for this recipe. You may sub the coconut milk and water for 1 3/4 cups of PLAIN soy milk and 1/4 cup neutral flavored oil. For a Smoked Gouda Alfredo, simply add 2 tbsp liquid smoke to the sauce. You may sub corn starch, potato starch or arrowroot powder for the tapioca starch, but it will not deliver the same texture. Thank you! I used to love Alfredo Fettuccine before I went plant based and I’ve missed it a lot. This is so delicious and so healthy I feel good about eating it. Thank you, thank you, thank you! Thank you for sharing your recipe, I would like to try it but what could I substitute for coconut milk? Could almond or rice milk be used? Please advise. Yes, you can leave it out, it just gives it a hint of cheese flavor, but it’s still very delicious without it! My boyfriend is allergic to dairy, soy, and nuts. I have been searching for a recipe similar to this for months. Fettuccine Alfredo was his favorite meal before his dairy allergy developed. I made it tonight and he said it is easily a 10 out of 10. He even licked his plate clean. Thank you so much!! 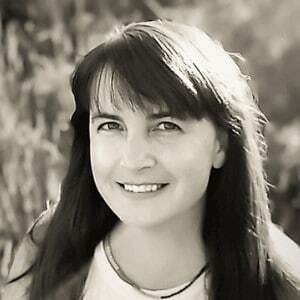 Hi Lesley, Glad to hear that you liked it! Jerk seasoning sounds like a delicious addition! I just made this dish and was extremely impressed by how it turned out and tasted. I added more veggies such as red onion, green peas, and bell peppers. This is going to be my new staple dish! Ps. I also made vegan garlic bread to go with it. Hi! This is delicious!! La hice el mismo día que me llegó la receta y es sabrosa y súper secilla de hacer. Es mi nueva favorita!! Gracias!!! Wow. 2 tbsp liquid smoke??? I use Colgins, proportionately that would be overpowering. Awesome recipe – easy, quick, creamy and tasty.